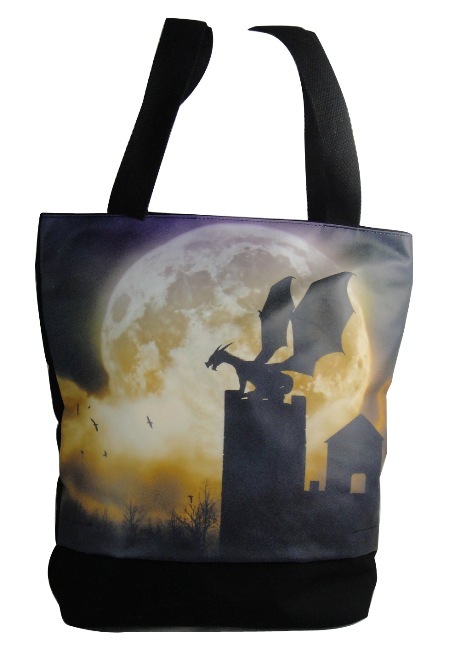 Dragon Castle Guardian Hand Bag Tote  - $23.99 : Mystic Crypt, the most unique, hard to find items at ghoulishly great prices! This purse is called Castle Guardian by Julie Fain. It is a black polyester bag that is embellished on one side with the design, on a light pvc type material. The bag measures 14 1/2inches tall x 13 3/4 inches wide and 4 inches in depth. This purse closes with a zipper closure on top. Inside there is a zipper pouch and organizer pockets/ cell phone pouch. An additional zipper compartment is located on the blank side of the bag.